The skin is made up of three layers. The epidermis is the outer protective layer made up of rows of cells that are stacked like bricks in a wall. The basement layer of the epidermis contains the pigment producing cells known as melanocytes that determine skin colour. 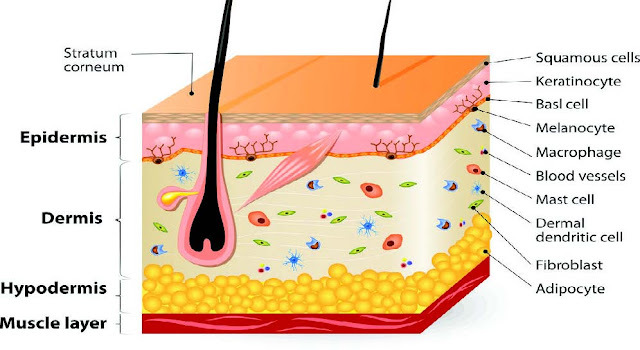 The dermis, the middle layer, consists of connective tissue, capillaries, nerves, hair bulbs, oil and sweat glands, and collagen producing cells called fibroblasts. Supporting collagen and elastin fibres weave through the dermis giving the skin firmness and flexibility. The subcutaneous layer lies beneath the dermis and is composed of fat and connective tissue. The muscle lies beneath this layer. With the aging process, the epidermis thickens and becomes drier leading to a dull lifeless appearance. The breakdown of collagen and elastin fibres in the dermis causes the skin to sag. This also leads to an increase in its fragility. In addition, the collagen producing fibroblasts are less active. Sun damage may stimulate an increased production of capillaries which show up as spider veins. There are prescription chemical peels such as the Vipeel and the ZO Medical 3 Step Peel are my favourites and are safe to use on all skin types. Tropical treatments aimed at improving the dermis are available to boost collagen production and these include copper peptide and Vitamin C containing preparations. If you use both, apply at different times of the day or different areas as Vitamin C may neutralise copper. Vitamin A containing products in addition to exfoliating the epidermis boost collagen production in the dermis. Kinerase (N-furfuryladenine) is a plant growth hormone which, like Retin-A improves the appearance of fine lines and evens out blotchy skin discolouration. It penetrates the skin cells repairing and slowing down age related damage. It is safe to use during pregnancy and is a good option for sensitive skin types. Antioxidants slow down the aging process by neutralising free radical damage and stimulating fibroblast activity. These include Vitamins C and E, Copper peptide, Co-Enzyme Q 10 and Alpha Lipoic Acid. There is a wide variety of products containing these. For the deep furrows and frown lines caused by the build up underlying musculature, treatment is geared towards softening and relaxing muscle contractions. Botox, derived from botulinum toxin, injected, can paralyse muscles that produce “frown lines” on the forehead, fine lines or “crows-feet” around the eyes and other wrinkles found in the upper zone of the face. In select patients, Botox may be used in the lower part of the face. Injections which are required every three to six months, temporarily paralyse the muscles, smoothing out the overlying skin. Results are seen about two weeks after the injection is given. Other derivatives of botulinum toxin are Myobloc and Dysport. Possible complications of Botox use include, headache, respiratory infection, blepharoptosis (temporary eyelid droop), nausea and flu syndrome. Safety depends on the experience of the Physician. There are also less invasive topical creams that relax muscles. Biologique Recherche offers very effective topical treatments for wrinkles including a specialized machine that provides instant results. Surgical facelifts achieve results by pulling and tightening lax skin to smoothen out its surface. There is a surgical procedure that permanently erases the frown lines between the eyes by excising the corrugator muscle which causes the furrow lines. Non surgical facelifts are aimed at boosting collagen production and tightening underlying tissue. This can be achieved by use of Nonablative lasers which plump up the skin without injury to the outer layer. A series of four treatments at three week intervals is usually required. Laser treatments are not recommended for individuals with darker skin as there is a greater potential for permanent scarring and pigment change. There are machines that lift and tighten the aging face without surgery, without lasers and without recovery time. This technology uses gentle radio frequency waves which tighten existing collagen and boosts collagen production resulting in tighter, firmer skin. It is safe for all skin types. Use of wrinkle fillers such as Restylane which is a genetically engineered version of human Hyaluronic acid is very popular. Hyaluronic acid is a jelly-like substance abundant in young skin that markedly diminishes with age causing the skin to cave in and produce wrinkles. It gives terrific results when used to fill nasolabial folds (laugh lines), fine lines around the mouth, crow’s feet at the corners of the eyes, cheek depressions and some facial scars. It has little or no side effects and lasts longer (up to one year) than other fillers like bovine collagen (Zyderm collagen for filling fine lines and Zyplast collagen for volume and bulk). Fat cells from your own body may also be injected as a filler to plump up the skin. No matter what your skincare regimen is, the number one rule to decelerate aging is to never leave home in the daylight hours without wearing your sunblock. This is the strongest line of defense. It’s important to exercise regularly to improve skin vascularity, eat a balanced diet rich in antioxidants and drink plenty of water (at least eight glasses a day). These measures enhance overall health, which is bound to affect your skin positively. Early intervention counts to prevent and repair damage to all layers of the skin.